Seminoma is the most common type of pure germ cell tumor (GCT) of the testicles and accounts for around half of all cases of testicular cancer. Read and know all about this type of cancer, including its possible causes, symptoms, diagnosis, treatment options and more. It is one of the two major forms of cancer of the testicles, the male reproductive glands that are positioned in the scrotum. It is a slow-growing tumor that is generally found in men who are between 30-40 years of age. Generally, the cancer is only in the testicles although it may spread to the lymph nodes. This tumor is also referred to as “Classical Seminoma” or “Pure Seminoma”. The ICD9 Code for this disorder is 186. The overall incidence of this type of tumor is 6-10 times higher in white people than black ones, which is demonstrated in all age groups. It is interesting to note that the overall development of GCT, and particularly Seminoma, has an important relation with people of high economic status. For reasons unknown, the overall incidence of this type of humor has progressively increased in various different countries in the 21st century. This type of lump is generally benign, or non-cancerous in nature. 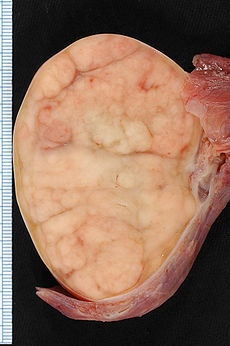 This testicular lump is not progressive or recurrent. It arises only in rare cases. As the name indicates, this form of lump is cancerous. However, the above factors have not been confirmed to be actually associated with this disease. In the recent decades, genetic association has also been evaluated. In around 80% of Seminomas, a consistent change in chromosome is present. The mean age of manifestation of symptoms is 40 years. In patients of nonseminomatous testicular tumors, this median age is around 30 to 35 years. Seminoma tumors can also arise in older men. In rare cases, it may also be found to develop in younger boys. In general, Seminomas do not result in any signs and symptoms and are detected when men observe lumps in their testicles. Up to 90% of affected individuals manifest symptoms such as inflammation or other palpable abnormalities. In rare cases, sufferers may also experience pain. Locationwise, the majority of Seminoma tumors are intratesticular. These develop in the germ cells in the testicles. These can arise in extragonadal regions along the midline of the human body. Typical extragonadal spots include the Central Nervous System (CNS) and the mediastinum. Variations in behavior and medical outcome indicate that Seminomas in the mediastinal spots are biologically different from those in gonadal spots. In contrast, tumors that develop in the retroperitoneum are almost always related with premalignant lesions in one of the testicles. Clinically, these can behave like metastatic testicular Seminomas. Increased levels of the serum hCG or human chorionic gonadotropin may occur in Seminomas. These may correlate with syncytriotrophoblastic giant cells, as may be seen histologically. Serum hcG has a mild to moderate increase in around 10% sufferers of clinical Stage I Seminoma as well as 25% people with metastasis. Even in that case, Gynecomastia is rare. Alpha fetoprotein (AFP) is not produced by cells of Seminoma. The detection of its serum generally suggests a nonseminomatous component. However, minimal elevations of AFP may be as a result of Hepatopathy, including Metastatic Seminoma to the liver. The strongest risk factor for this disease is Cryptorchidism, with an increase in risk as much for the contralateral one as for the affected testis. Cryptorchidism is a fetal abnormality that arises when one or both testes are unable to descend into the scrotum from the region of their development in the abdomen. Those with a history of testicular cancer or undescended testicles are at a higher risk of developing malignant tumors such as Seminoma. While men in their 30s or 40s are most susceptible to this type of tumor, these growths can arise at any age. The results and findings obtained through such tests can help physicians develop a proper diagnostic and treatment plan. This form of cancer shows very good response to medical treatment, particularly when detected in the early stages. The outcome for sufferers can be excellent if they get proper treatment in time. Hitorically, the preferred treatment for this condition has been the removal of the testicle that is affected. According to medical studies, there is no need for surgical removal of testicles when Seminoma is caught in the early stages. Chemotherapy or radiation can be equally effective. Such growths are extremely susceptible to chemotherapy and radiation treatment measures and should shrink after a number of sessions. Testicle removal can be explored as a curable option in case there is a concern regarding reduced response to medical treatment. Treatment and management of these growths are essentially the same, whether patients are 15 or 50 years of age. Both oncologists and urologists can be involved in the treatment of this type of cancer, aided by supportive care providers such as nurses. If there are concerns about future fertility, one can consult a fertility specialist to receive additional information. These growths have a very slow growth. They can spread to the lymph nodes as well as other areas of the body if they are not timely detected. Due to this reason, physicians usually recommend medical imaging studies for men with Seminoma to detect signs of malignant cells elsewhere in the body. The cancer commonly spreads to other areas of the body, such as the lungs, spine, abdomen and retroperitoneal region – the area close to the kidneys behind the other organs in the abdominal area. There can be complications of surgery, such as infection and bleeding in the post-operative stages. If both testicles are removed, problems of infertility would arise. This is one of the most curable forms of cancer. For men with early-stage Seminoma, the survival rate is higher than 95%. Based on the size of the tumor and the time of initiation of treatment, the disease-free rate of survival for Stage II and III cancers is a little reduced. The risk of development of this condition can be lowered by carefully monitoring the health of sufferers. Those having a family history of the disease, or similar conditions, should make appointment with physicians in case of any abnormal changes. This can ensure early diagnosis and treatment for cancers. As no effective screening technique is known, The United States Preventive Services has recommended against routine screening for cancer of the testicles. However, the recommendation is not applicable if there is a personal history of an undescended testis. Patients of this condition often suffer from ailment-related stress by joining a support group. Visit http://www.cancer.org for support and further information. This is the official website for The National Cancer Institute. This is the second most common form of testicular tumor in male dogs. It typically affects dogs older than 4 years. The condition is supposed to arise as a result of the fetal abnormality known as Cryptorchidism. The diameter of these growths usually measure less than 2 cms. In affected dogs, no clinical symptoms are manifested in Seminoma. Due to this reason, these growths are difficult to detect. Some dogs, however, suffer from pain as a result of pressure from the enlarging tumor. The testicular tumor in dogs can be felt in a few cases. In still rarer cases, some growths of this type can turn malignant and metastasize to other areas of the body. The condition is diagnosed in dogs by a physical examination, conducted by veterinarians. During physical tests, vets usually look for a testicular lump and try to ascertain whether or not they are palpable. Dogs with these types of growths may suffer from pain and abnormally large testicles. Generally, laboratory tests like CBC (Complete Blood Count), Urinalysis and biochemistry profile are within normal ranges. However, an ultrasound examination of the testicular tissue may show the presence of a lump. In cases where an abnormal lump is revealed, a veterinarian may perform a biopsy of a tissue of the testicular lump for further assessment. If that is not possible, affected dogs may require castration for confirmation of the diagnosis. The preferred choice of treatment is the removal of tumor, which can best be done by castration of the affected dog. However, if the tumor is malignant or has metastasized to other areas of the body, chemotherapy may be recommended by veterinarians. Usually, the overall outcome is excellent for affected dogs that undergo castration. However, this depends on whether or not the tumor is malignant or benign. 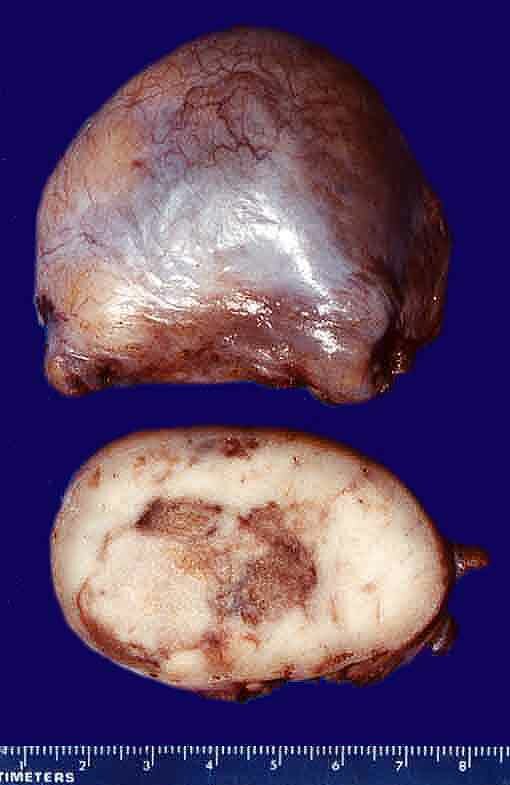 The images below would help you understand how this abnormal testicular lump looks like. If you suspect yourself or anyone in your family, such as your pets, to be suffering from Seminomas, make an immediate appointment with a professional health care provider to get an earlier diagnosis and treatment. As aforesaid, this condition can be cured and prevented from worsening with the aid of quicker detection and cure. Naturally, you should not delay curative options while the disorder is still in its early stages.